This game could be installed either stand-alone or as an expansion to IL-2 Sturmovik: Forgotten Battles. 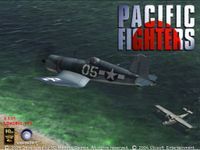 Fly a variety of WWII fighters and bombers and relive the famous Pacific battles such as Pearl Harbor in this accurate and action-packed combat flight simulation, from the creators of the critically acclaimed IL-2 series. New Pacific theatre including many famous locations such as Pearl Harbor, Okinawa, Iwo Jima and Midway. Take off from, land on and engage new aircraft carriers. Take part in large-scale multiplayer engagements in a variety of online modes. Over 40 flyable aircraft models including: Aichi D3A1 Val * Bristol Beaufighter * Douglas A-20 Havoc * Douglas SBD Dauntless * Grumman F6F Hellcat * Kawasaki Ki-61 Tony * Mitsubishi A6M Zero * Mitsubishi G4M1 Betty * North American B-25 Mitchell * Supermarine Seafire and Vought F4U-1 Corsair.